"The ebb and flow of will is like the movements of the tides... if we cease our vain struggles and lamentations long enough to look away from the personal self... we realize life is going well with us after all." Charles B. Newcomb So then, I put aside my lamentations regarding the weather, the struggles of working with 3 fine strands of yarn, and finished the sleeves. My Japanese tea leaves is complete. But there is that ebb and flow of will, and as you can see, I have chosen a completely different buttons. These reminded me of yin and yang, or yin yang as it is know, how polar or seemingly contrary forces are interconnected and interdependent in the natural world, and how they give rise to each other in turn. you can vaguely see it within these images, but I have used contrasting gradients of tsumugi they are interconnected,yet independent, and these gradients of yarn give rise to each other, and complement and enhance the whole. So I have come to realize that life is going well after all. There are new projects to be started... 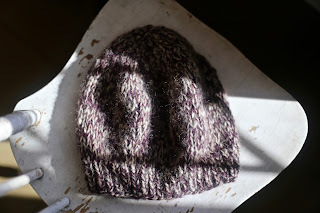 There is hope for Spring... And I need to start a Friday Night Knitting Club... anyone interested? Your sweater is beautiful! The yarn has such a nice texture, and the buttons are great. It does come down to will, come to think of it; that has always been a weakness of mine...thank you for the spot-on quote. It really turned out beautiful Theresa.I love the heathered yarn, very pretty color...and it goes so well with your blond hair. I am starting the arms today. ...and yes, sign me up for the friday knitting club...that would be so fun! 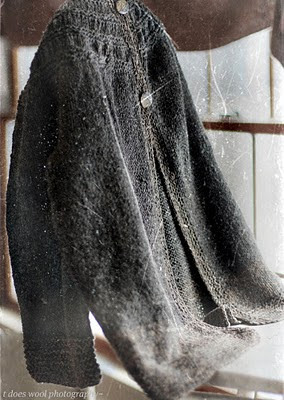 How so gratifying to put all the elements together to create such a beauty of a sweater. Oh, and the words just hammered the nail in the right place! p.s. I read the article in the Mag yesterday and truly enjoyed it! i read that book a while ago - i will be interested in what you think. there are two more in the series. it is lovely! i have seen sooooo many wonderful versions of this across blogland! it makes me want to have one too. maybe next winter, too many plans right now. so so beautiful... and beautiful on you. 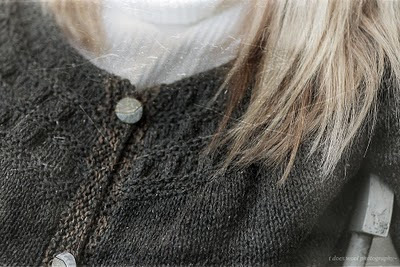 The sweater came out gorgeous - I was surprised by the buttons - though these are lovely too! What does the Friday Night Knitting Club entail? The buttons look great, nice to see it all finished. I would love to be in the Friday night knitting club, knitting, nattering, eating cake and drinking tea! i'm sad to say there has been a distinct lack of clicking needles here this winter, not quite sure why because there's plenty to be doing... ! Your sweater is beautiful! I love reading your blog and looking at what you are working on. Tell us more about the Friday Night Knitting Club. Would love to join. You are the master! Looooove that sweater. I actually have Friday Night Knitting club...I got about 1/4 through it and put it down (not sure why as it was a great book!). I'll join the club (as long as I don't have to knit...lol). Let me know how that works out. Very pretty button choice! A riday Night Knitting Club sounds like so much fun. I wish I were nearby. I'm happy you are looking forward to Spring ~ it's almost here and is such a fun time of year, what with rabbits and Easter eggs. if i could knit, i would be at your table. and that is a fabulous book. i even loved 'Knit Two" - the sequel. Beautiful cardigan, I love your yarn choice. Lovely as always, T. I like the hint of color in the last photo and can't wait to see where you take it. Isn't if funny to just keep going with a project about which you've got some initial doubts ... and then to see it all turns out well. That Friday Night KC book was, I do believe, based on the ambiance of a certain knit shop in my own neighborhood. I began reading the book, but could not finish it. Most of the book just seemed a bit cliche'd. Glad that author got it published, and that lots of folks loved the books. And very glad if it encouraged more knitting. Having typed all that, I would be very interested to see what you might come up with regarding a virtual club of knitters who might trade projects, inspirations, fave yarns, etc. Beautiful, as usual. Love the buttons. A Friday night knitting club sounds wonderful. Wish I were close enough to participate! oh, it is gorgeous! i have been wanting to make it... and in grey since i saw it.... i can bet you will wear that A LOT! i'd enjoy some friday night knitting! 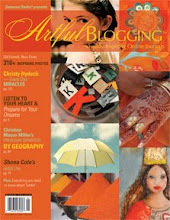 Congrats on being featured in "Artful Blogging" magazine ~ loved your article. Your sweater and the sleeves came out beautifully. The buttons are perfect. I love and can relate to what you say about yin and yang. The quote is perfect. Thanks so much for sharing and I will have to read The Friday Night Knitting Club! The sweater is lovely, and the photography out of this world, again:)I'll be reading something along with you - I read The Friday club sometimes back - I am tackling a ridiculously long Stephen King, just because I haven't read him since about 1984:) Then the new Picoult book is in the mail from Amazon, can't wait!! Another beautiful sweater as always. Those buttons are perfect. Goodness, I did not know you used a threel-strand yarn! I have not looked at anything knitting related. I am so so. Work is heinous right now and all I have energy for is to browse other people's blogs and photos :) Thank goodness other people out there are knitting. Gorgeous photos! Knitting is the perfect zen activity. It looks so, so soft! Your sweater is beautiful...as always. Enjoy the book! I've read it already. Happy weekend T! Your sweater is amazing!!!! i love it!! wow, it's stunning. something about the simplicity of gray. in particular i love the generous cuffs. being friday, i think a friday night knitting club is a perfect idea.